The Thunder ran their Hawk set on 9 of their final 10 halfcourt possessions last night. Let's break it down. Anatomy of a Play is a recurring feature where I take a set and break it down to show the ins-and-outs of what’s happening on the court. In the latest Friday Film, I highlighted a set that the Oklahoma City Thunder have recently installed and been turning to with more regularity in crunch time. It’s a set that involves all three of their stars simultaneously, and, as a result, can force the defense into difficult choices. Multiple alert readers noticed it and tweeted about it. Last night, in their game against Utah, the Thunder went full Hawk: of their last 10 halfcourt possessions, they ran this Hawk set on 9 of them. And it worked. 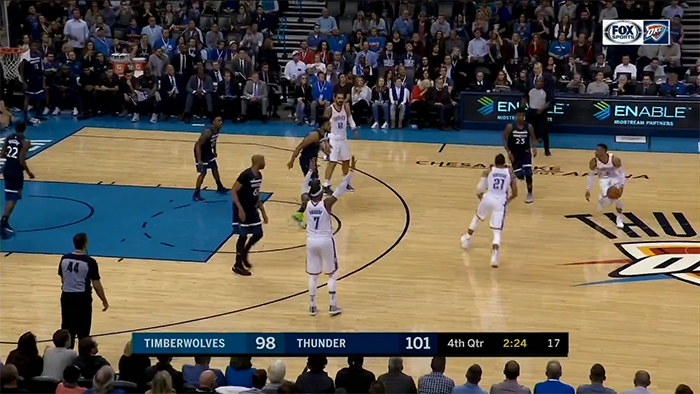 One time the ball was poked out of bounds and OKC retained control — on the other 8 plays they scored 15 points (including immediate putbacks off the misses). Some of this was great shot making, but some was also the increasing comfort and familiarity running this set. There is still room for improvement, but the Thunder reacted well to a variety of defensive tactics utilized by the Jazz. Let’s go through each of these plays and analyze them.